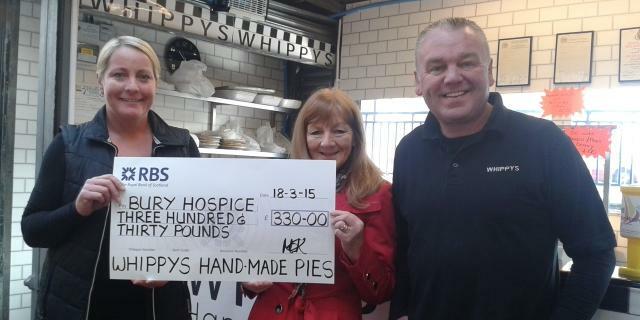 Bury Market traders served up a tasty treat for Bury Hospice during National Pie Week. Emma Scott and Peter Whipp, of Whippy's Home-made Pies, raised £330 on their stall during the week which they have now presented to the well-loved local charity. Peter said: "I was happy to be able to support this most worthy cause and hope to be able to continue to support the organisation in the future. Thanks should also go to my neighbours 'Quality Canvas' and 'Cass Fruit and veg' who donated raffle prizes, and to my customers who continue to support my business." Whippy's Pies are based on Margaret Block on Wednesday, Friday and Saturdays. The pies will also be on sale to raise funds at the forthcoming Bury Hospice Spring Fair on Saturday 11 April 2015. Picture: Market traders Emma Scott (left) and Peter Whipp present the cheque to Pamela Byrom from Bury Hospice.